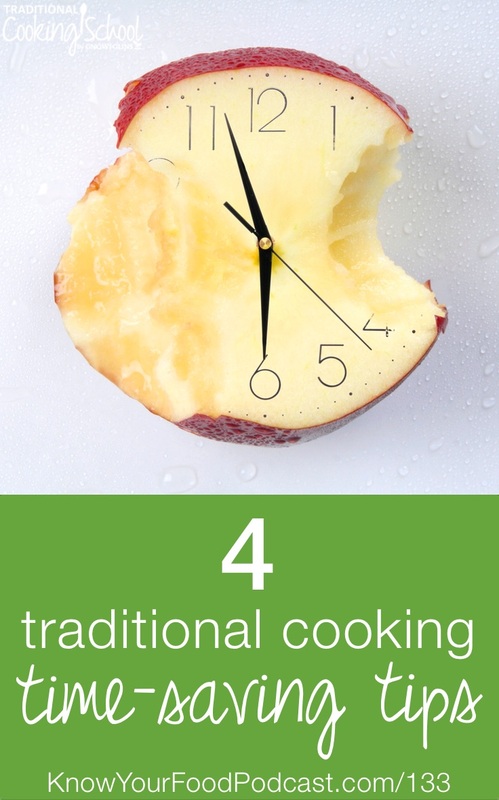 Of course I want to hear your answers… and in this podcast, I'm sharing four of my own time-saving traditional cooking tips. Tip #1: Why do later what you can do now? This is a really hard one for me, actually. I have to push myself to follow through with this one (when there isn't a deadline). My best time to implement this tip is in the morning. I'm in the kitchen already preparing breakfast. I have small amounts of time while I'm waiting for this or that, so I do other things that need doing like switching batches of water kefir or Kombucha, feeding the sourdough starter, washing up some dishes, getting something going for dinner. Time and time again, I have given myself a gift of time later on in the day or week because I did something that could be done when I didn't really have to do it. It really feels good to leave the kitchen in the morning knowing that a bulk of your food prep is done and you can move on to other things. Tip #2: Do the hard things first. Got a task you're dreading? Do it first, get it out of the way. I've learned that if I'm going to fit in exercise, I have to do it in the morning before everything else or it tends not to happen. Same goes for the kitchen. Everything else feels like coasting once you make the big uphill climb. Tip #3: Think one day ahead. Healthy cooking doesn’t require that much more time overall — what it requires is a little thinking ahead. For most meals using traditional preparation methods, you need plan only one day ahead. You already spend time preparing food, so just do it a little earlier. Assuming you have a stocked pantry, most foods need eight to twelve hours of preparation. I do my planning and preparing at two times of the day — evening and morning. In the evening, I plan my meals for the next day. I set out things that need to be soaked or soured. For example, I get the morning oatmeal soaking. I get the sourdough bread dough resting for the next day’s lunch. I start soaking flour/batter for muffins. I start soaking beans. I put thawed meat in the crockpot to cook long and low. The next morning, I cook the oatmeal, beans and bake the muffins — and I also start soaking the grains I’ll cook up for dinner. This cycle repeats daily. What I think you’ll find is that if you shift your thinking ahead, you’ll end up thanking yourself because the meals will become easy breezy. This is what happens when you do much of the planning and prep work ahead of time. Tip #4: Figure out what kind of menu planner you are and work with it. I've noticed there are two types of menu planners — those that plan a menu and shop accordingly and those that stock a pantry and “shop” there for a daily menu. Here's one of those places where your personal strengths come into play. Don't force yourself into a method where you can't flourish. If you're the first kind of planner, make a menu and follow it. In our weekly menu plan (for premium members of Traditional Cooking School), I provide a weekly chart to write down what's on the menu for breakfast, lunch, and dinner. It also includes spaces to write down any necessary AM and PM prep. If you're the second kind of planner, you probably already know what you like to keep in your pantry. The idea is you create meals from things you have on hand, which can vary seasonally. I am this type of menu planner, without a doubt. And of course there are people in-between. When I have big things happening in my life, I do more of #1 because it saves me from having to think when I'm in the thick of things.